Info : Chiang Mai is the biggest place to hold Songkran tradition in Thailand between 13-15 April every year. Chiang Mai people call Songkran Day as “New Year Day” or “Wan Sangkarn Long” and consider the end of last year and welcome new year. Sangkarn Long means our age passed by one more year. 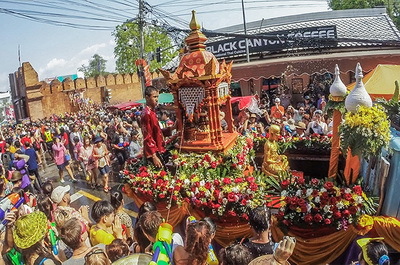 Chiang Mai people will parade Phra Buddha Sihing, Miss Songkran’s parade with attractive and adorn decoration and water this Buddha Image; including sand pagoda formation, watering elders to ask for blessing, watering one another, and other fun activities. Location ; Every area in Chiang Mai. 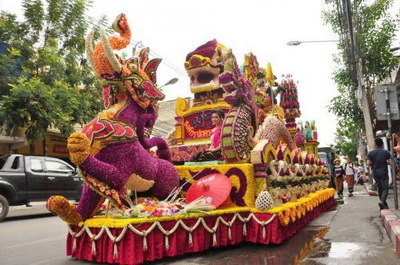 Info : There has been Mai Kham Po Parade over 200 years in Amphur Chom Thong to make Buddhism go on. And it is believed that offering Mai Kham Po will restore your fortune and you will never lack of help when you are in need. 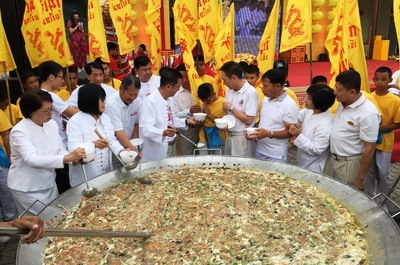 In every April 15th local people will hold Mai Kham Po Parade tradition in the center of Amphur Chom Tong, where Wat Phrathat Sri Chom Thong is the first and only place as the master of this Lanna parade in the world, so it has been popular all over the northern region. Location ; Chom Thong District Office and Wat Phrathat Sri Chom Thong Varaviharn in Chiang Mai. Info : Worshipping Inthakin Pillar ceremony or the City Pillar has been inherited and observed by Lanna people for a long time. 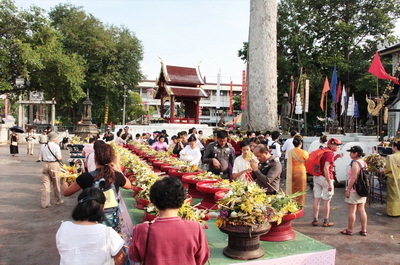 This ceremony II occur between May and June from 13th day of waning moon of 8th Thai lunar month, called “Inthakin Entering Day”, to 4th day of waxing oon of 9th Thai lunar month. The people will partake to observe the ceremony at Wat Chedi Luang to enhance good luck for themselves id their families. Read More…. Yee Peng is the annual festival held to celebrate the full moon in the northern capital of Chiang Mai on the day preceding Loy Krathong by one day in November. The word “Yee Peng” is the northern Thai term referring to the full moon of the 12th lunar month in the Buddhist calendar. 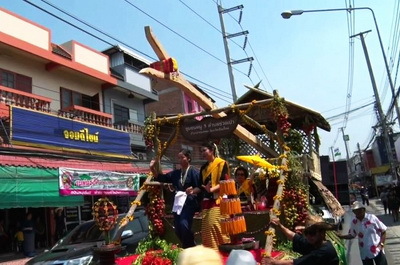 Both of Thais and foreigners look forward to visiting “Chiang Mai Flower Festival” every year, which it has bee held continuously for over 40 years. Location ; At the foot of Nawarat Bridge, Tha Pae Gate, and NongBuak Had Public Park. 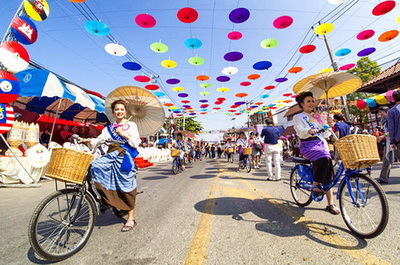 Bo Sang Umbrella San Kampaeng Festival will be held as “Street Fair” 1 km from the entrance to the end of Bo Sang Handicrafts Village. The symbolic umbrellas will be used to decorate houses and shops together with lamps in Lanna folk style. 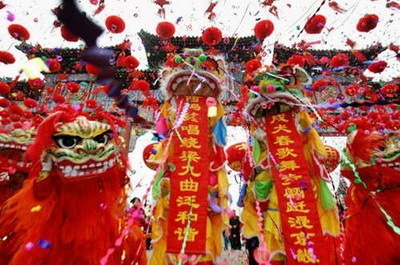 In the festival there are umbrellas’ parades, handicraft contest, handicrafts stores, and eating Khan Tok dinner, Bo Sang Queen contest, folk cultural art performances, and other entertainments. Location ; Bo Sang Handicraft Village on Bo Sang-San Khampaeng Road. “Sinjia Yu-ie Sinnie Huad Chai” means lucky new year with wealth for all. During Chinese New Year Festival, Chinese and Chinese-Thai people who live around Witchyanont Road, Chang Moi Road, Kuang Mane Road, and Trok Lao Jow in Chiang Mai will join decorating with red-light lamps and setting tabernacle to worship their ancestors together. Location ; Trok Lao Jow Road, Waroros Market in AmphurMuang. “Eating Vegetables” comes from Chinese word “Jia Chai” that means eating only vegetables without any meat and not even cooking with garlic, onions, laggiao, garlic chives, and tobacco leaves. 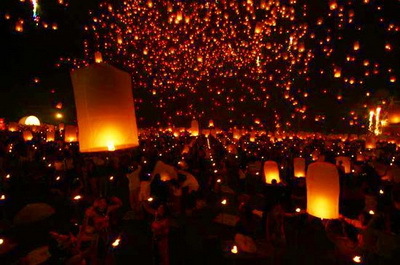 This festival is in 9th lunar month as Chinese calendar for 9 days, that it is October for Thais and held every year. Location ; Chiang Mai Buddha Meeting Hall, Amphur Muang, Chiang Mai.